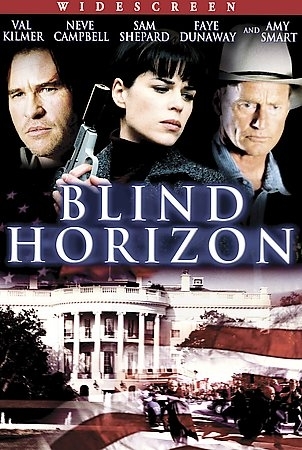 A thriller that resurrects the Hollywood trope of a protagonist with amnesia, BLIND HORIZON injects the cliche with new life by asking pertinent questions about the nature of personal responsibilty. Frank (Val Kilmer, THE MISSING) awakens in the desert with a severe head wound, and no memory of how it--or he--got there. He does, however, experience visions of an assassination attempt on the president, and is convinced they contain clues to the truth. He is also pretty sure that the woman claiming to be his girlfriend, Chloe (Neve Campbell, THE COMPANY, SCREAM), is not who she says she is. When Frank hears that the president is actually coming to the small New Mexico town, he warns Sheriff Kolb (Sam Shepard, ALL THE PRETTY HORSES) of the impending violence, but Kolb is otherwise occupied with an upcoming election campaign. Struggling to put together the pieces of his past, Frank enters a race against time to convince those around him of the veracity of his claims, before it's too late.